The Motion Picture Academy does an injustice not only to the recipients but to their worldwide fans by continuing its new policy of presenting honorary Oscars, the Thalberg and other special awards at a special function in November instead of the Academy Awards ceremony next February on ABC. In the announcement by Academy President Tom Sherak that Francis Ford Coppola will get the Irving Thalberg Award and that renowned character actor Eli Wallach and director Jean-Luc Godard will get special Oscars, along with historian Kevin Brownlow, one can't dispute the selections, but one can sure question the means of delivery. It is also a chance -- sometimes the last one -- for the man or woman to get a resounding cheer that reverberates across the continents. I had a part in the special Academy Awards that were presented to Myrna Loy and Deborah Kerr, through letter writing campaigns to elicit support from many of the colleagues of these great actresses. In the case of Myrna Loy, one of the biggest stars of the 1930s and 1940s, she had never been nominated. Deborah Kerr was not so unfortunate and had been nominated six times for her eclectic body of work in the forties, fifties and sixties. But she never got an Oscar, a record that could be a great Final Jeopardy Question: Most nominations for Best Actress who never won. But Deborah Kerr was a bit younger at 72 and was healthy enough to come to the ceremony. 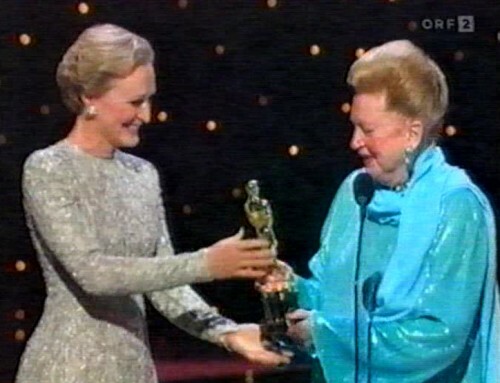 After the short tribute speech by Glenn Close and a look at some film clips her name was announced. When she came forward, a bit frail and blinded by the lights, the audience response was electric and they gave her a standing ovation of well over a minute, longer than Steven Spielberg's for Schindler's List or Tom Hanks, that year's winner for Best Actor in Philadelphia. At the Academy Awards this year, a few minutes were set aside to show some moments from the previously held dinner, but when the moment came to point to Bacall and Corman, who weren't even invited on stage, as is the case of many acting Emmy winners who earlier received their awards at the Creative Arts ceremony, their names were announced and the camera showed Bacall and Corman in the audience for a second or so as the director quickly cut to a commercial. The Academy hierarchy changes year in and year out. Let's hope its future leaders take a look at some of the tapes in the archives or the sites on YouTube, Facebook and Twitter to see just what they've given up in denying these honorees their proper Bravos and deserved standing ovations during the Academy Awards telecast and the thrill of knowing their special moment is being transmitted and enjoyed by their many, many fans throughout the planet.